Is a visit of Grand Canyon West”s Skywalk worth the long drive? While we can not answer this question for you, we can give you some information to help you with your decision. How to drive from Las Vegas to the Grand Canyon Skywalk – Click Here! Grand Canyon Skywalk was opened to the public on March 28th 2007 offers a unique experience – walking on air (almost) above the Grand Canyon on Hualapai Tribal Land. It can be a little unsettling to look down through the glass a couple of thousand feet to the Canyon floor below if you have a fear of heights, but for those who don’t it is a wonderful experience! 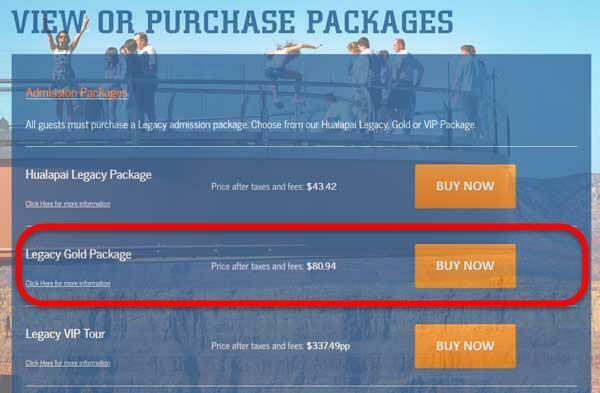 The Legacy Gold Package is the Ticket Price of $80.94 for the Grand Canyon Skywalk. This has caused some confusion over time. You CANNOT just buy a Ticket to the Grand Canyon Skywalk ONLY. You MUST buy the Legacy Gold Package OR Legacy VIP Package to enter the Skywalk -OR- it MUST be included in the Tour you book from Las Vegas. Traveling to the Skywalk takes a few hours from Las Vegas – a couple more from Phoenix. If you are sensitive to price, the entrance fee is quite high but the experience is unforgettable. If you prefer to let someone else do the driving, there are several tour options from Las Vegas. News Media Personnel were allowed on the Skywalk the day it opened and allowed to take pictures of Buzz Aldrin as he walked across it. Grand Canyon West is the only part of the Grand Canyon that allows helicopter to land below the rim. You might see a variety of Wildlife at Grand Canyon West including Coyotes, Big Horn Sheep, Mule Deer, Foxes, Burros, and Eagles. Ultimately, the choice is yours! Will you visit the Skywalk at Grand Canyon West? If you do, it is best to come in the late fall to early spring months of October, November, December, January and February. The weather is generally nice with temperatures in the cool to warm range. An occasional snow storm may come through the area but it generally doesn’t close the road for more than a day, if even that. Summer is generally very hot! As long as you check the weather before your arrival you should be able to adjust accordingly.